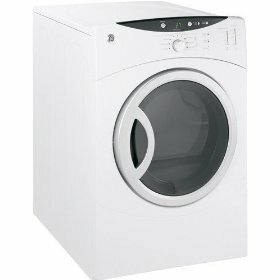 I bought this dryer with my GE Super Capacity Washing Machine. It works marvelously and I have never had a problem with it. I haven't had to repair it yet and it is two years old. I loved that it was very stylish and matched my decor. It has a very easy lint removal system that even alerts you when its time to change the filter. It has multiple heat selections. I never have to set the timer longer because it does such a well job at thoroughly drying a load. It is very spacious and can dry two extra large blankets at once. I was never able to dry my comforter in my old dryer and would have to go to the laundromat around here, but not anymore. There is a drying rack that lets you place sweaters, sneakers, pillows or other delicates on top of it. It's a very quiet dryer and I highly recommend it. It is a very durable machine and can handle a lot of abuse. I use it every day and sometimes my kids have things in their pockets that shouldn't be there. I have dried toys, crayons, coins, rubber balls and much more but it never harmed my dryer.